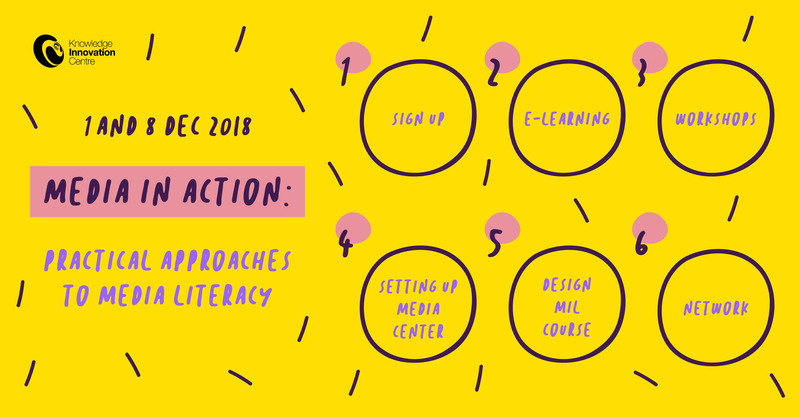 By the end of this course, you will obtain novel approaches in teaching media literacy to young people, enhanced with inventive tools to set up classroom media centre. You will feel empowered to address issues of fake news, media bias, information overload, and critically assess media landscape within your youth network. It enables you to motivate youth to “take control” of the media they consume and become active creators of the media content. Young people you work with will be inspired by media in action, and practical approaches to media literacy. How can I adjust the pedagogy of teaching media literacy to inspire student discussions on global issues, and their critical evaluation of media content? In total 12 hours of your engagement! Plus any classroom activities or projects. LEARN about media literacy, pedagogy of teaching media literacy and using various tools to set up media centres. JOIN a community of European educators committed to utilizing Media in Action approach. CURATE a collection of artefacts created within the media centre. TAKE ACTION with the youth you work with and advance their skills. REFLECT on your experience of using Media in Action approach and consider other topics and service-learning projects that can motivate youth you work with. Martin Debattista is a digital media and digital education academic, writer and strategist. With graduate studies in Malta and post-graduate studies in the UK, he is a senior academic at the Institute of Tourism Studies (Malta) and a visiting lecturer at the University of Malta. Martin has a long experience in electronic and digital media production and copywriting, being considered a pioneer in Maltese online journalism. He currently focuses on digital education and e-learning and is an advocate of open education and connected learning in formal, non-formal and informal environments.